An integral part of the brewing process involves the cellaring – or aging – of the beer. The amount of cellar time required for a fresh brew of beer varies according to beer style and other factors. Most ales, for example, require very little – if any – cellar time to finish, while lagers need additional time for cold aging. Lagers originated in Germany and were traditionally aged in limestone cellars under cool conditions. In fact, the style gets its name from the German word “lager,” meaning “to store.” Lager beers are cold-aged in the cellar to allow them time to properly finish. This process can take anywhere from two to five weeks (or longer), depending on the yeast strain and the ABV of the finished product, among other factors. The cold-aging of lagers creates the crisp, clean finish that is associated with the style. At Anchor, we brew Anchor Steam Beer and Anchor California Lager with our own lager yeast, which are then lagered in our cellar for 10 and 28 days respectively. Other Anchor brews are cellared from 10 to 14 days. In the case of ales, lagering is usually not part of the brewing process. When fermentation is finished, most ales are ready for consumption. Higher fermentation temperatures, generally stronger flavors, and variations in yeast properties are all part of the equation. 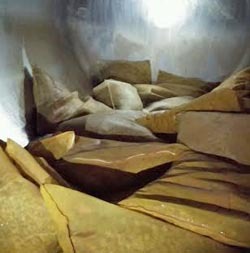 Mesh bags filled with hops in a cellar tank awaiting a brew for dry-hopping. There are always exceptions, of course. Today’s craft breweries are brewing a variety of ales that require differing cellar times to finish. For example, Liberty Ale and Go West! IPA are dry-hopped ales, and the dry-hopping process requires longer cellar time. In the case of Liberty Ale, a single hop ale, we dry-hop for 10 days. Go West! IPA, on the other hand, uses several varieties of dry hops, as well as a greater proportion per barrel, and requires 14 days to finish. 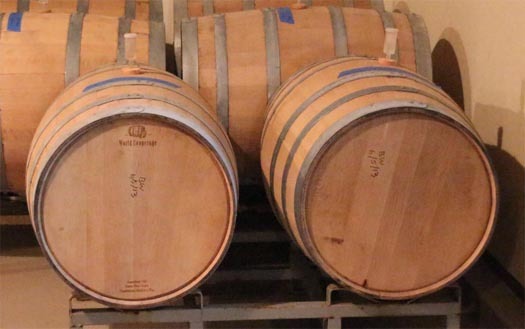 Ales that are aged in wood require extended cellaring to pick up the flavor character of the barrels. Our Barrel Ale, a limited-release beer produced for draught only, is aged in our own Old Potrero Whiskey barrels for periods of time which can range from several months to up to a year or more. Each release is different depending on the blend of ales. After wood-aging, the ales are transferred to a cellar tank for blending and some further finishing before being packaged. The entire process usually takes from nine months to a year. Most modern breweries no longer need to have cellars for aging. In most cases, the beer is fermented from start to finish in the same tank, known as a “unitank.” Unitanks are vertical, rather than horizontal like traditional cellar tanks. They also have cooling jackets, as do some lager tanks, that can control the temperature of the fermentation at any stage, allowing the brewery to mimic the conditions of a traditional cellar. Lagers can be held longer and at colder temperatures while ales can be finished in a matter of days. Originally, Anchor used only horizontal cellar tanks, which are typical of most post-prohibition lager breweries. Ongoing expansion has completely filled all available cellar space with these so we have installed a few 400-barrel unitanks to keep up with demand. 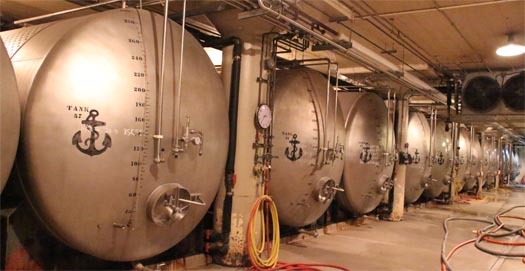 At Anchor Brewing we have approximately 80 cellar tanks of various sizes. About half of them, the newer ones, are of a 300-barrel size. We also use a number of 55-barrel tanks from our old location, which are of a configuration that fit into the limited space of our previous facility. They are, however, fully functional in spite of the smaller size and we use them on a daily basis. We also have a half-dozen 110-barrel tanks which were originally used for dry-hopping but are now in general use.